The 507th Parachute Infantry Regiment was activated on July 20, 1942 at Camp Toccoa, Georgia under the command of Lieutenant Colonel George V Millett Jr. After jump-training at Fort Benning, Georgia the Regiment was sent in garisson to the Army air base of Alliance, Nebraska and became part of the 1st Airborne Brigade. After arriving in North Ireland on December 1943, the 507th PIR was attached to the 82nd Airborne Division to replace the 504th PIR that had suffered heavy casualties in Italy. The Regiment moved to Nottingham, England in March 1944 to prepare for the European invasion (D-day). The 507th PIR first saw combat during the Normandy invasion on June 6, 1944. The Regiment's objective was to help secure the Merderet river crossings. The area selected for the jump was called Drop Zone T. It was located noth of Amfreville (France). Because of the clouds and german flak, the night drop was not a success and left troopers spread out over a twenty miles area. Colonel Millett, was captured three days after the drop in the vicinity of Amfreville. Only the 2nd Battalion under the command of Lieutenant Colonel Charles J Timmes was able to function as a team and began digging in around Cauquigny on the west bank of the Merderet River. 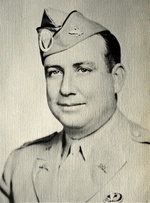 After the Colonel Millett's capture, the command of the 507th PIR was transferred to Colonel Edson Raff, a veteran of the 509th Parachute Infantry Battalion. 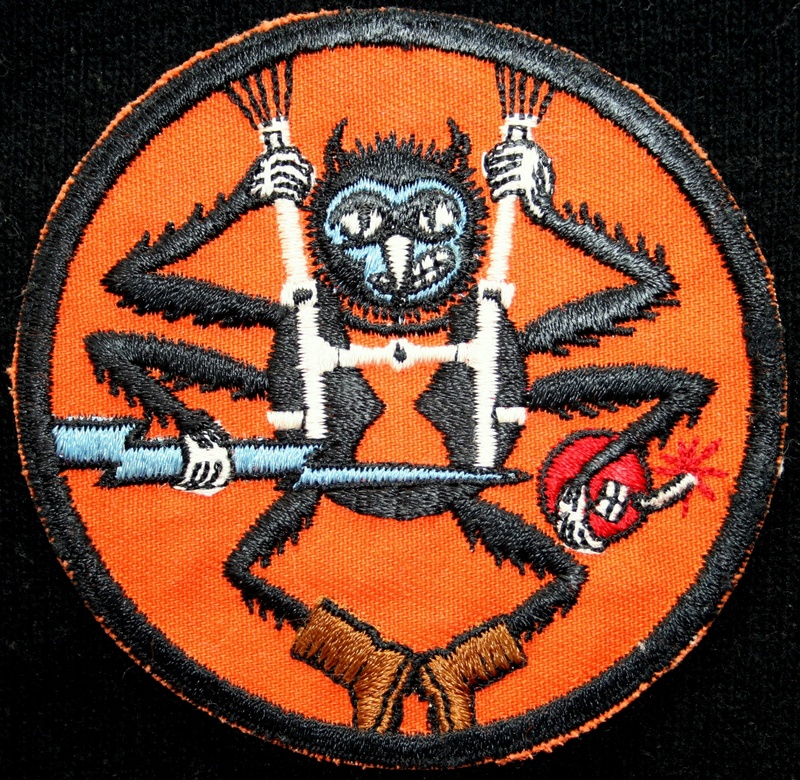 The 507th PIR later becam known as "Raff's Ruffians" and kept this nickname until the end of War. After 33 days of continuous combat the 507th PIR returned to England aboard LSTs. 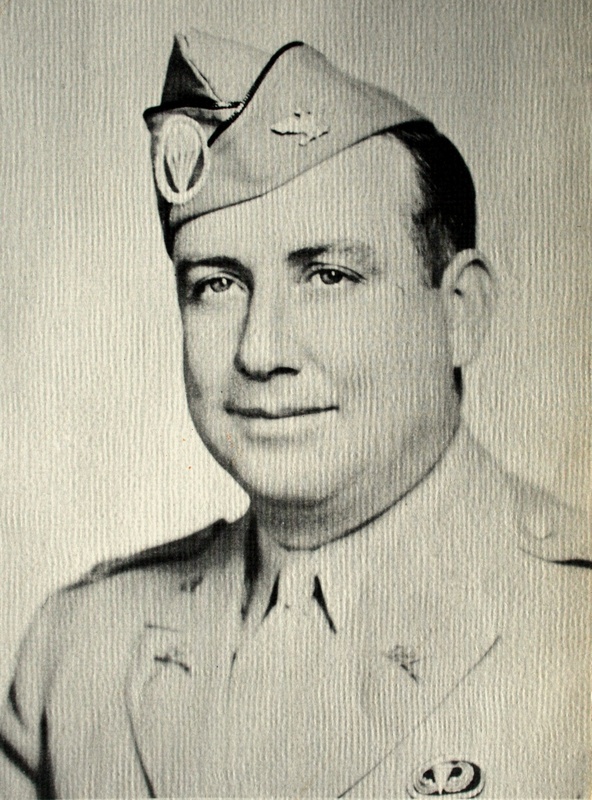 In August, 1944 General Matthew Ridgway took command of the newly formed XVIII Airborne Corps which included the 17th, 82nd and 101st Airborne Divisions. The 504th PIR was now at full strength and was reassigned to the 82nd Airborne Division. Since the 17th Airborne Division was in need of another parachute regiment to full out its ranks, it was determined that the 507th PIR would be permanently assigned to it. Jump training in England ? 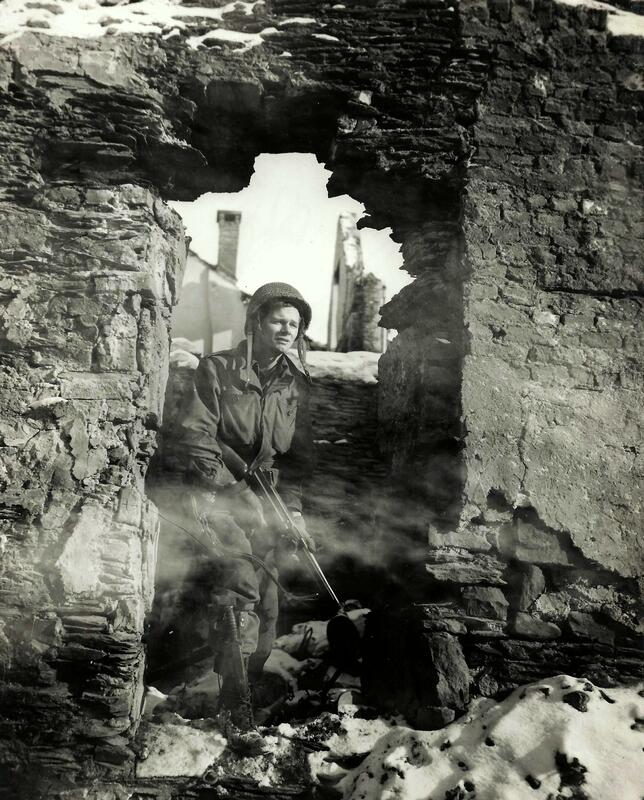 This photo comes from the memorabilia of Wendell F ANDERSON (ASN 37176818) - Cie HQII 507th PIR. There is no comment on the reverside side and it is so impossible to locate the scene. The little road with hedges and trees looks like England. Is it a jump training sometimes in 1944 ? (original photo (unpublished ?) - TFH collection). The 507th PIR redeployed to France with the 17th Airborne Division on December 25, 1944 and participated in the counter-attacks against the Germans in January and early February of 1945. After the battle of "Dead man ridge" the 17th Airborne Division progresses rapidly across the Ardennes to try to capture German units in a surrounding movment with the 1st US Army on north. These three photos illustrate the junction between the 1st and 3rd US Army in the little belgian city of La Roche (Belgium) on January 15, 1945. The second man from the left is Staff Sergent Lawrence Becker (ASN 19096554) and the man on the right is Pfc. Charles Baird (14161476) from Hq Co, 1st Bn., 507 Regt. (National Archives). The legend of this less known photo says "Pfc. Charles Baird, Memphis, Tenn, is framed in a hole blasted in a wall at La Roche, Belgium. 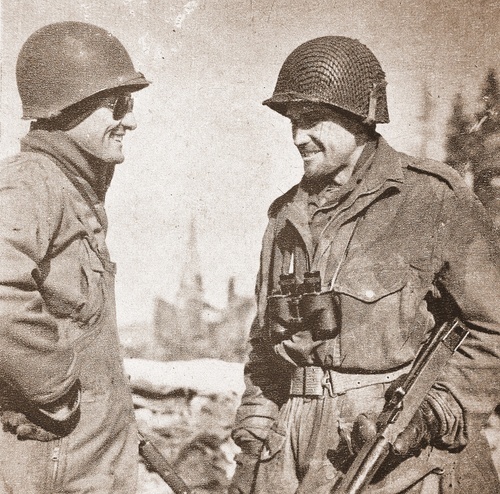 He is a member of a patrol of the U.S. Third Army soldiers who first met with troops of the U.S. First Army in the front line town of La Roche. The patrol hiked at least 20 miles in freezing weather through snwo-covered hills and forests for the first meeting of the two Armies. He is a member if Hq Co, 1st Bn., 507 Regt., 17th Airborne, U.S. Third Army. 15 January 1945". Charles E Baird (ASN 14161476) was born in Ohio in 1923. He was volunteer for the Army and joined Camp Forrest on November 20, 1942. He fought with the 507th PIR during the Bulge and in Germany. On March 24, 1945, he was in the C47 number 72-92706 and jumped in fourth position of his stick ! Click to enlarge (Original US Army Signal Corps - TFH collection). On February 10, 1945 the 507th PIR was relieved and returned to its base camp at Chalons-sur-Marne in France. Operation Varsity was the second combat jump for the 507th PIR. The Drop Zone selected for the Regiment was located at the southern edge of the Diersfordter Forest, three mile northwest of Wesel. It was during this operation that Pfc George J Peters won the Congressional Medal of Honor. Pfc Peters and a group of 10 other troopers landed in an open field near the town of Fluren. Raked by enemy machine gun fire the troopers laid there helplessly. 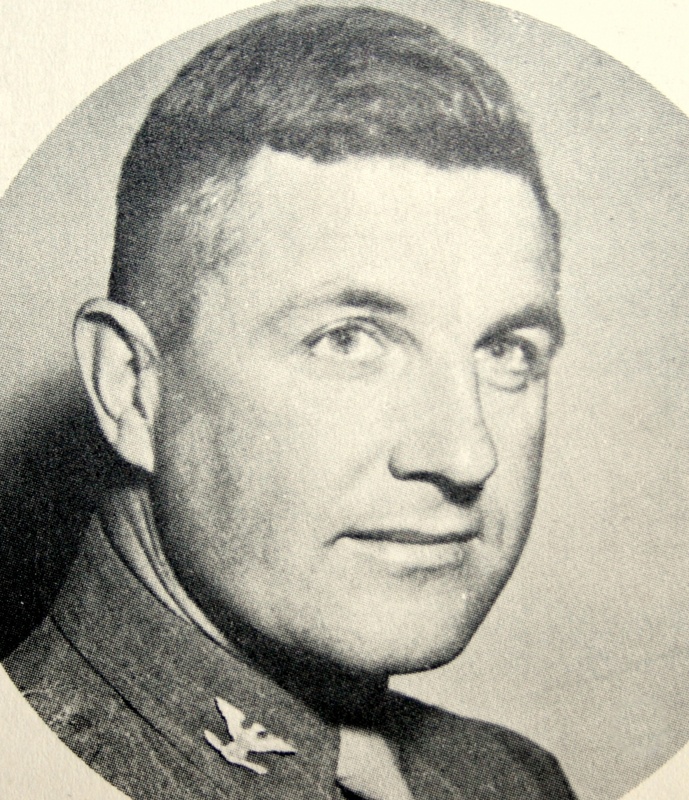 Peters, armed with only his rifle and a few grenades took it upon himself to charge the German machine gun nest. After receiving several wounds and bleeding profusely Peters crawled to within 15 feet of the gun enplacement and pitched two grenades into the enemy stronghold. The ensuing explosion silenced the machine gun and its crew. In the ensuing days the 17th Airborne would lead the thrust into the heartland of Germany. On April 10th the 507th captured Essen, the home of the Krupps Steelworks. 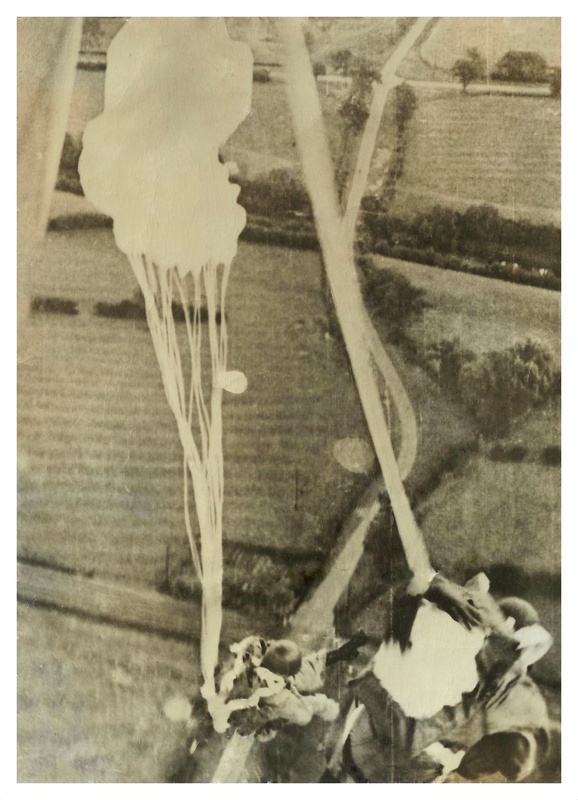 This photo was realised on April 10, 1945 near Essen (Germany) by Sgt T. J. Austin (Signal Corps). 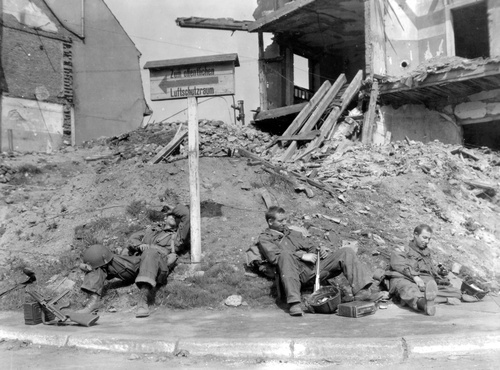 It shows three troopers of the 507th PIR who take a break after 5 days frontline fightings. From left to right : Pvt William H. Sandy (ASN 13032007) from Charlottesville, VA, Sgt Dehaven Nowlin from Goshen, KY and Pvt Howard Fredericks (ASN 39241668) from Los Angeles, CA (credit US Army Signal Corps - TFH collection). In early June, 1945 the Regiment leaved Germany to Rambervillers (France). 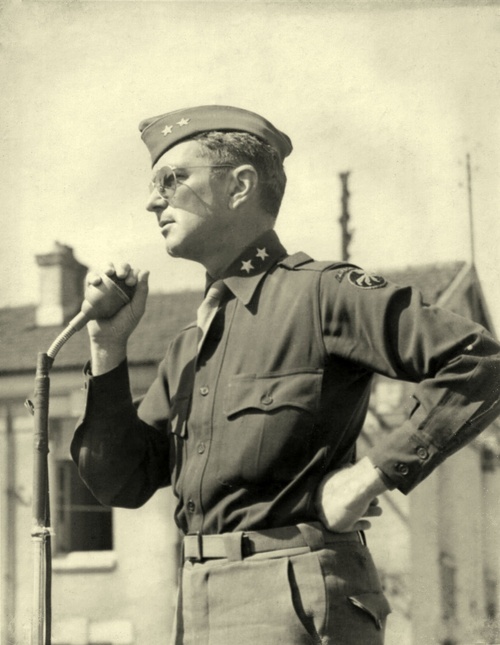 At this time, the American Supreme Headquarter decided to send the 82nd Airborne Division in Berlin for occupation duty and to dissolved the 17th Airborne Division. To reorganise the 505th PIR / 82nd AB it was decided to merge it with the 507th PIR / 17th AB. At this occasion, an official ceremony was held on June 21, 1945. The Regiment with the other components of the 17th AB leaved this area in late August to Marseille port of embarcation. General William Miley, Commander of the 17th Airborne Division speaks during a ceremony at Rambervillers (France) after the VE day, no other information writing on the reverse side of the photo. 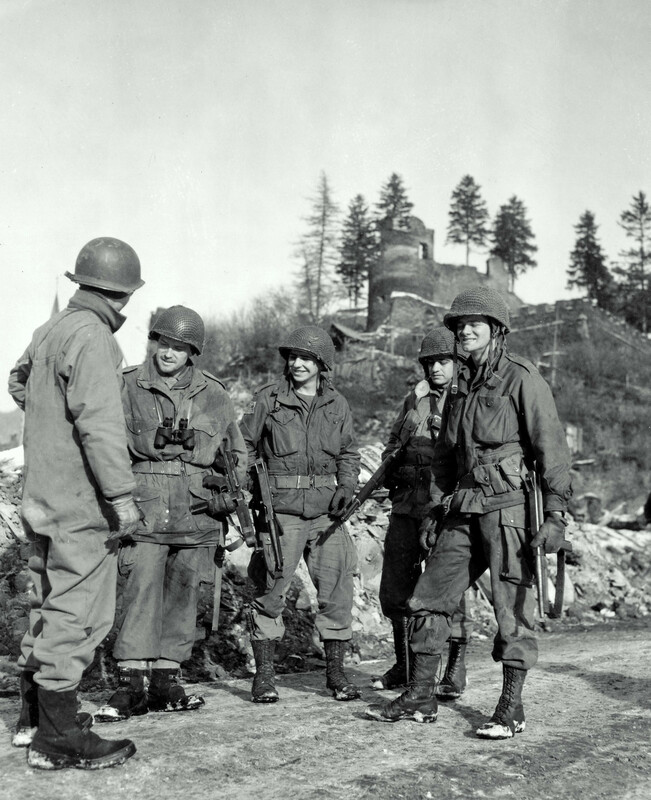 At this time, the 507th PIR was stationned in the vicinity of the city. In early June, the Supreme Headquarter has decided to send the 82nd Airborne Division in occupation at Berlin and to dissolved the 17th Airborne Division. To reorganise the 505th PIR / 82nd AB it was decided to merge it with the 507th PIR / 17th AB. At this occasion, an official ceremony was held on June 21, 1945. The photo was probably realised during this time. It belonged to Lewis M ALLEN (ASN 32012898) from HQ I Company - 507th PIR (unpublished photo ? - TFH collection). 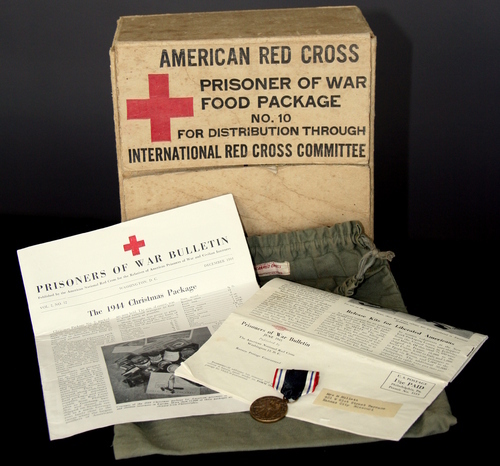 In September, 1945 the 17th Airborne Division with 507th PIR was shipped home and deactivated.